Dark evenings and bonfires; ghosts and ghouls; scary costumes, trick-or-treat, and of course, apple bobbing! Just some of the images that Halloween conjures up. But for many, the celebration of this season is contrary to their faith. Now there is a new way of tackling this annual dilemma. Friends and Heroes, producers of the award-winning Bible adventure TV series, have developed two great resources to enable parents and churches to plan lively, fun and stimulating parties as alternatives to the traditional Halloween celebrations. Friends Forever! and Bright Sparks contain everything you need to plan an exciting, interactive party evening at any time of year, but especially Halloween. With games; craft activities; quizzes; food ideas; and of course, the excellent animated adventures of Macky and Portia on DVD, all you need to add are the children and the ice cream! Friends Forever! is based on Friends and Heroes Episode 1 and Bright Sparks on Episode 3. Both are suitable for children aged 6-10 and can be used at any time of the year. Promotional material (on CD) and Public Display Licences (voucher) for the parties are included in each pack. People who already have these episodes they can purchase just the additional materials as a download or on CD-ROM. Friends Forever! – Full pack, including animated DVD £19.99. Download of additional material only: £10. Additional material supplied on CD-ROM: £12.50. 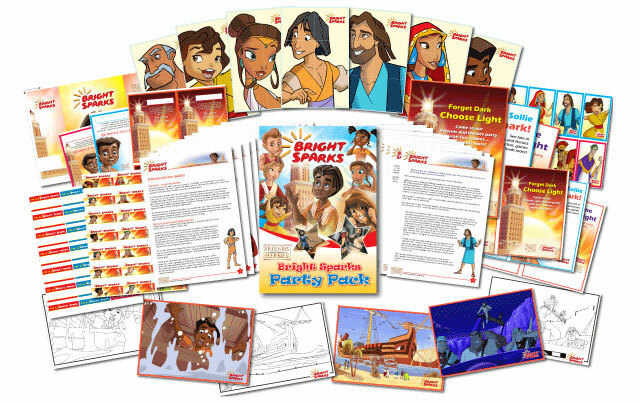 Bright Sparks – Full Pack, including animated DVD £15. Download of additional materials only: £10. Additional material supplied on CD-ROM: £12.50.